Showing your album as a slide show can come in handy in many situations. Most online photo sharing services offer a slide show feature with automatic advance. 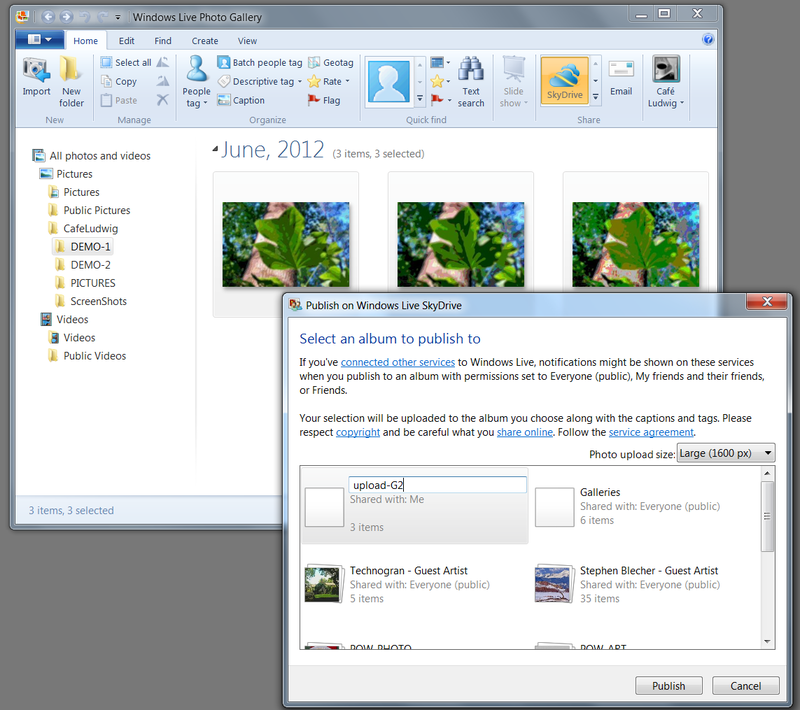 Since Windows Live SkyDrive recently disabled this feature I have received many inquiries about how to present photos automatically. 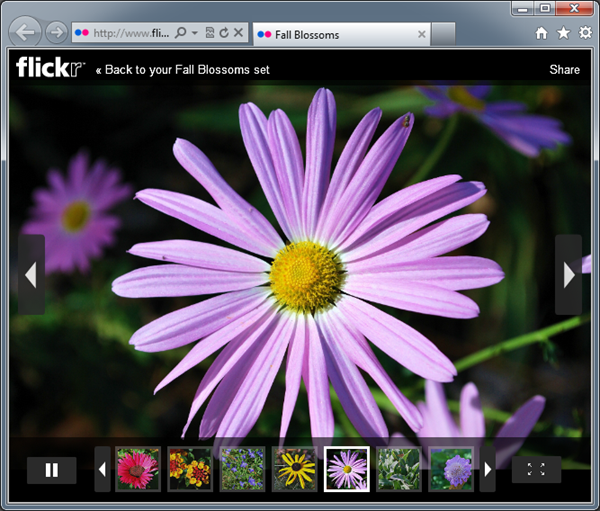 Here is a comparison of a photo album as presented by Flickr, Picasaweb, myPicturetown and Shutterfly. The album, consisting of 16 reduced-resolution images (1024 pixel horizontal dimension), was uploaded to each photo sharing service. There is a short download delay, but the images download rapidly. The slide show runs right from the link, no need to click a play button. The slide show does not automatically cycle after it has played through. The default setting is to scale images to the browser window or to the full screen(F11). The option menu calls this quaintly “Embiggen small things to fill screen”. It is possible to get to the author’s “Photostream” with a keyboard shortcut (“m”). The slide show has to be manually started with the “play” button in the control strip at the bottom. Tools for managing the slide show timing are right there. The images are not enlarged beyond the actual size. For this album the photos do not fill a large screen but are surrounded by black. Not scaling has the advantage that the photos do not become unsharp as is the case when they are enlarged beyond their actual pixel size. With this service there is a significant download delay before the album appears. The slide show does not start by itself but is started with the “play” button (lower left). The slide show goes immediately to full screen and the images are scaled up to fill the screen. Accompanying the slide show is a music track. The viewer can turn the music off or make another selection (from 5). By default the show recycles and starts over again and again. The Shutterfly slide show starts right away. Images are not enlarged beyond their actual size. The show plays just once and must be manually repeated. The controls at the top of the photo remain even when full screen mode (F11) is selected. The viewer of these slide shows cannot get to other parts of the author’s shared photos, except for the Flickr show, as noted. Obtaining the web address, URL, of a slide show is just a matter of starting a slide show when you are signed in to your account and copying the address from the browser address bar. This is not available for a show in myPicturetown. For that service, the address is obtained by a “share album” feature (it sends an email with the URL). Which photo sharing service provides the best slide show? That depends, of course, on your preferences. All of these photo sharing services, and there are many others, do things a little bit differently. We all have our on individual likes and dislikes. If you would like to share your opinion, please comment on this post. Nikon has offered a photo sharing service for quite some time and recently made improvements. With a claimed user base of over a million and a half it is not among the largest sharing services but offers some nice features. 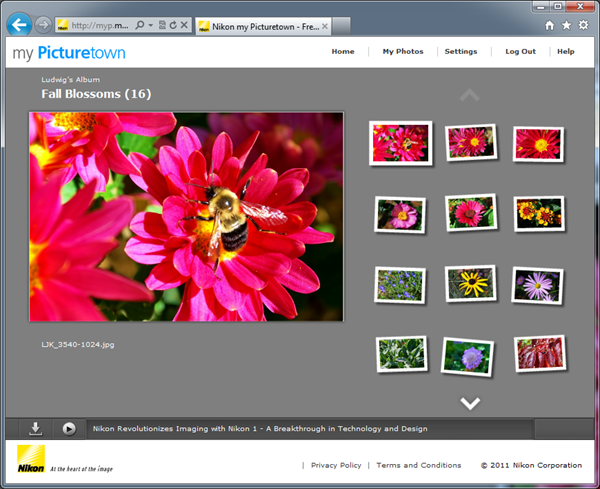 You do not have to be a Nikon photographer to set up an account at myPicturetown. Two levels are offered: a free account with 2 GB of storage and a fee-based “Gold” account with more storage and additional features. The site requires Adobe Flash Player and the user interface has some unexpected quirks, it is also unexpectedly slow in operation. In addition there is an up-loader app you install on your computer that used Adobe AIR. 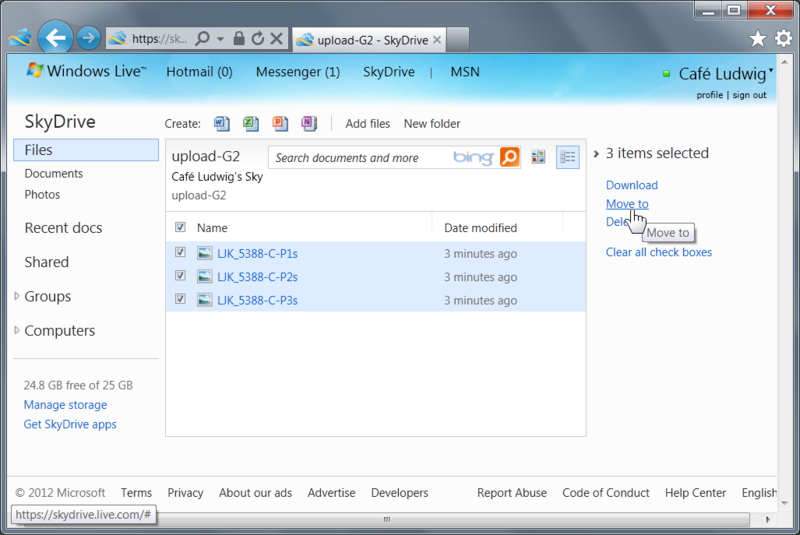 Sharing photos is by email – somewhat like sharing a SkyDrive album. I prefer a clean web address like you get at Flickr or Picasaweb, but that is not available. The generated email message is quite pleasant and looks like the one shown here. The “View photos” link is extra-ordinarily long, not something to be typed by hand. If you wish to share in a way other than the email link, an URL shortening service is advised. One nice feature is that you share just one album. The recipient can view the photos an a pleasant slide show, but cannot view the rest of your site. In my opinion that is a definite plus. in the lower left starts a slide show, with music! The viewer has a set of tools to set the transition speed and effect and to pick the type of music track. Not much choice there, I don’t like any, but this is a nice touch. The viewer can also download the set of photos in the album as a ZIP file. Take a look at my album, either image above links to it, and see if this is something that would appal to you and your friends. 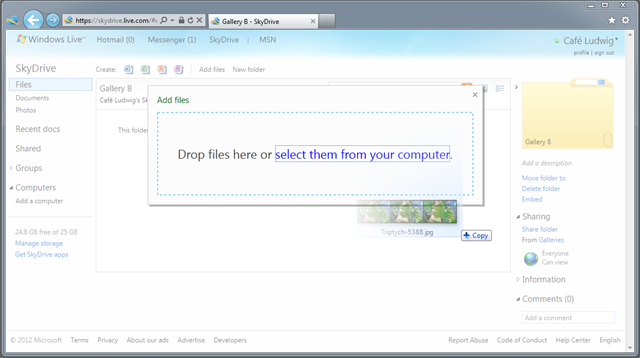 With the discontinuation of Windows Live Spaces the attractive “entrance page” and easy to share web address to SkyDrive albums is gone. None of the popular photo sharing sites, Flickr, Picasa Web Albums, or Windows Live Photos (on SkyDrive) have neat and customizable “front pages”. So what to do? I am reminded of the German saying “Not macht erfinderisch” – I will render it in English as “necessity fosters innovation”. WordPress, Blogger, and other blog sites, allow you to set up static pages. Windows Live Writer is an excellent tool for setting up and for maintaining such pages. 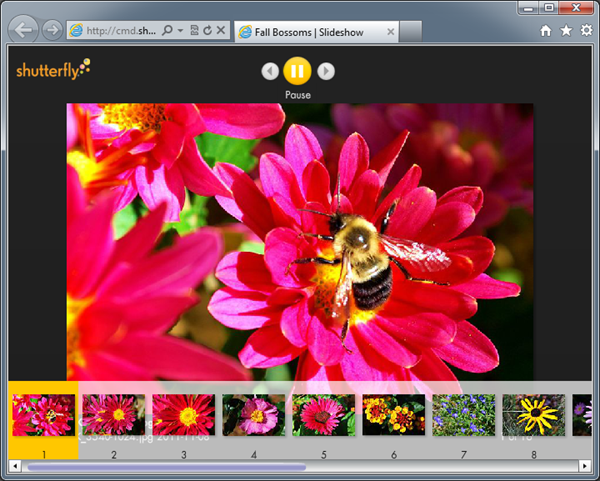 This way you can create your photo gallery page, or pages, just the way you like. What is more, the pictures can be sourced from SkyDrive, Flickr, Picasa Web Albums, Shutterfly, and many other free photo sharing sites. 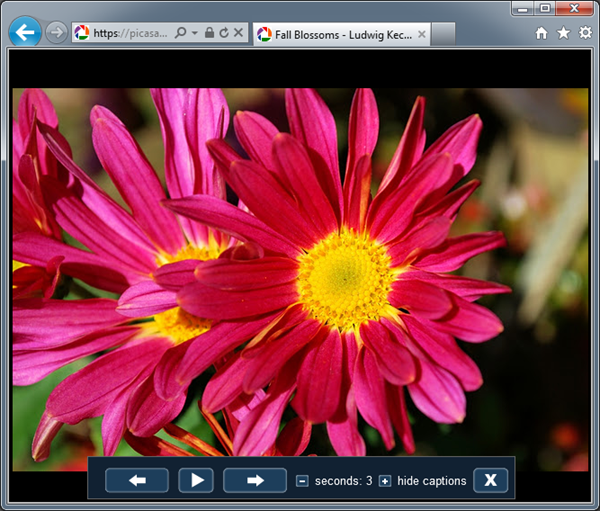 You can also incorporate links to specialized sites like Zoom.it and Photosynth. Here I will describe WordPress pages since this blog is at home on WordPress. First, of course, you need a blog account. All the blog sites make this an easy step-by-step process. If you have a blog module on your Windows Live Spaces site, you can migrate right over to WordPress (prior to March 2011 when Spaces shuts down). For some guidance on setting up a blog on WordPress see “How to set up a WordPress blog”. For a gallery page you probably have a certain look and feel in mind. WordPress offers many “themes”, in fact over a hundred, so there is likely one that fits your bill. Set up your blog to your liking. On how to customize your WordPress blog see “How do I customize my WordPress blog?”. In Windows Live Writer the process to connect to a blog account is also straight forward. For details see “How do I connect Windows Live Writer to my WordPress blog?”. Here is how to go about setting up the static page. Open Windows Live Writer. It will offer a blank blog post window. You can tell by the prominent “Enter a post title”. This is not what you want. 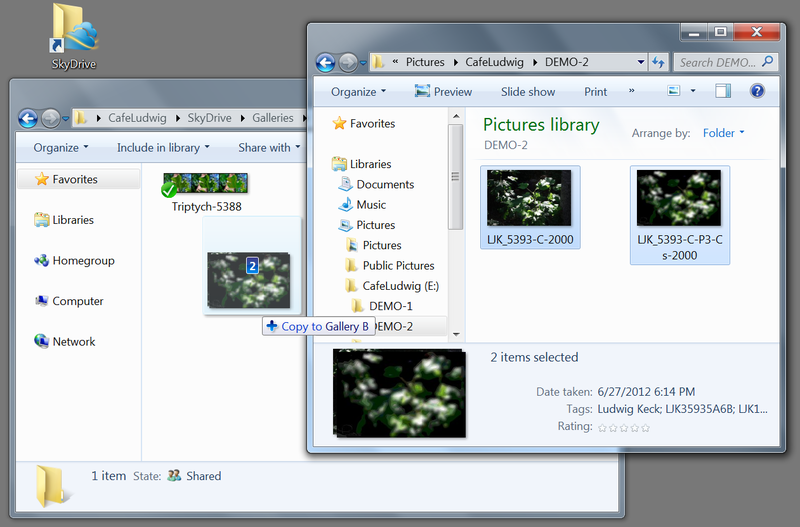 For this demonstration I will use “Gallery Ludwig” as the demo blog site. Click File (the leftmost tab on the Ribbon) . In the right pane click New Page. Now you get “Enter a page title”. 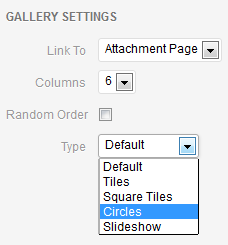 This not only allows you to put pictures and text on a page, but it sets it up and adds it to your blog. Enter the title you want for that page. Be careful, make sure of the name and spelling. For this demo I will call my new page “Gallery 1”. There are some other setup tasks to complete the static page, so add some text, maybe a picture in the main area and publish the page. You will be able to add to and modify the page later. Click the Home tab. Click Publish. The page will be uploaded and your browser will be opened to display the blog. 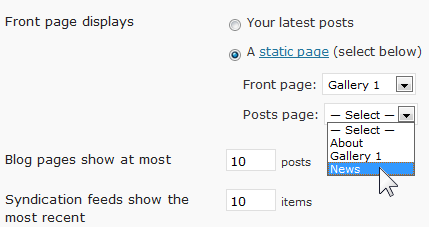 Next to configure the blog so visitors to your blog will see the static page first. Admire your initial effort and close the browser. On the Ribbon click Bog Account. Click Dashboard. The browser opens and takes you to your WordPress blog dashboard (you may have to sign in). Here there are two things to do: To set up another page that you will use to show your blog posts, and to set the static page as the landing page for visitors. In the left pane click the down arrowhead next to Pages. Then click Add New. This opens the editor for a new page. In the field showing “Enter title here” type the title for the blog post page. I chose “News” for mine. Scroll down and find the Publish button. Click it to add the page to your blog. In the left pane click the down-arrow next to Settings. Then click Reading. Here you select what the front page, the one visitors see first, should display. Click on the second choice, “static page”. Then you specify the page that is the front page and the page on which blog posts are to be shown. These are selected in the drop-down selection boxes. The page names will be available there. Here is my setting for the “Gallery 1” page to be first and the posts to be shown on the “News” page. Now you will also see why you set up a new page for the posts: so it will show in this selector and you can specify it correctly. Your blog is now configured for a static “landing” page and a separate blog post page. There are still some details to clean up. It shows “Home”, “About”, and “News”. I thought long and hard before I selected the title “Gallery 1” for my front page, and here it is called “Home”. Furthermore the “About” page is listed next. It is common for Internet sites to show the “About” page as the last item in the menu. This can be changed as well, but not in all cases for all themes. If it is ok with you the way it is, leave it alone. If you want to change the menu this can be done with a custom menu. Click: How do I install a custom menu on my WordPress blog? After publication of your page you can modify it, add to it, make any edit changes with Windows Live Writer. If you are running Windows 7 you might be able to open the page right from the Start menu: Click the Start button, move the pointer to Windows Live Writer then to the right to see the jump list. Click on the name of your page. The other way is to open Writer, click File (upper left tab), Open recent post and your page should be shown in the right pane. Click on it to open it. You can now modify the page: add to it, make any changes you wish. To refresh the modified page online just click Publish on the Home tab. In another post I discuss some of the ways of showing material on your gallery page from other sources. Good luck and much fun with your gallery!